You are here: Home / Home / Who will be the next new Grand Slam winner in men’s tennis? Who will be the next new Grand Slam winner in men’s tennis? Men’s tennis has been dominated over the last decade by the top four as Novak Djokovic, Roger Federer, Rafael Nadal and Andy Murray have only failed to win one of the Grand Slams on three different occasions since 2006. As Federer and Nadal enter the latter stages of their careers, the door is open for some new faces to get into contention in the big Grand Slam finals. Ahead of the 2016 French Open, here is a list of players who could be the next maiden winner of one of the four big tournaments in the sport. Japan’s Kei Nishikori is ranked sixth in the men’s world rankings at the time of writing but has been as high as number four in those standings. The 26-year-old is now considered as one of the most consistent players in the world’s top eight as he has reached the quarter-finals in three of the last five Grand Slam events. 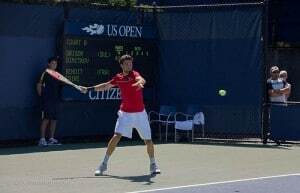 Nishikori made it through to his maiden Grand Slam final in 2014 at the US Open at Flushing Meadows in New York but was beaten in straight sets as he lacked the experience and composure to beat the big serving Marin Cilic in that final. The Asian star picked up wins over Milos Raonic and Stan Wawrinka at the tournament but it was his victory in the semi-final over the world number one Djokovic which stood out as he came out on top in four sets against the Serbian in a high-quality game. The next chance Nishikori gets in a Grand Slam final, he is likely to be better prepared to deal with the occasion. One of the biggest strengths Nishikori has over a lot of his rivals in the world’s top 10 is that he is comfortable on all three surfaces. His best game is arguably on the hard courts on the Tour but he is more than competitive on clay and grass, meaning he has an excellent chance of winning either the French Open or Wimbledon in the near future. Nishikori has now won 11 ATP Tour events and in 2014 he reached the semi-final of the ATP Tour Finals at the O2 Arena in London, where he was beaten by the eventual winner Djokovic in three sets. Nishikori still has time on his side to improve and is therefore arguably the most likely of all the players in men’s tennis at the moment to become a new Grand Slam winner. Czech Republic’s Tomas Berdych has only once reached a Grand Slam final and that came in the 2010 Wimbledon Championship where he was comprehensively beaten by Nadal in straight sets. He is, though, one of only a small group of players who have reached the semi-final or better in all four of the Grand Slams in the sport. On his day, Berdych is a match for anyone in men’s tennis. His big serve makes him very difficult to break, while at the baseline he is able to add interest to each return which comes back to him. At the age of 30, the Czech number one does not have too many years ahead of him at the top of the sport. He therefore really does need to pounce sooner rather than later if he is going to add a Grand Slam to his CV. If you were considering a free bet from the range on oddschecker, Berdych is a best price of 50/1 with some bookmakers to win the 2016 French Open at Roland Garros. However, there are other firms who think his chances are better than that as they are quoting 33/1 on the world number seven coming out on top in Paris for the second Grand Slam of the season. One of the records Berdych holds along with Argentina’s David Nalbandian is that he is one of only two men to have beaten Federer on multiple occasions at a Grand Slam before the semi-final stage. Those wins over Federer at the major tournaments prove he is able to produce his best tennis in the big games against the world’s best. Berdych brought his career ATP tournament tally up to 12 titles in 2015 when he won the Stockholm Open. His best chance of winning a Grand Slam may come in the US Open at the back end of the year. The top players have often had long campaigns by that point so he could take advantage of some tired legs. If it wasn’t for injuries, Canadian Raonic would probably be a Grand Slam winner by now. The big server has been hampered by a number of different problems, most notably his elbow on his right arm which has put him out of action for large parts of time. In May 2015, Raonic rose to number four in the world rankings as he gained a consistent run of results in the United States in a number of the ATP 1000 series events. The 25-year old reached his first Grand Slam semi-final at Wimbledon in 2014 when he lost in straight sets 6-4 6-4 6-4 to Federer. He repeated his best appearance in a Grand Slam earlier in the campaign at the Australian Open as he made it through to the last four once again but was beaten in Melbourne by Murray in five sets. Raonic led that game 2-1 in sets before the British number one won the final two sets to book his place in the final. Raonic first broke into the mainstream at the 2011 Australian Open where he advanced as a qualifier through to the fourth round before losing to David Ferrer. Although the Canadian has proved he is more than comfortable on grass, with his run to the final at Wimbledon in 2014 proving that, his preferred surface is hard court. The highest ranked Canadian in history has reached three ATP Tour Masters event finals. He made it through to the final of his home event, the Canadian Open in 2013, the 2014 Paris Masters and more recently in the 2016 Indian Wells Masters. Since his return from his latest injury, Raonic looks to have improved in the weaker areas of his game. He is now very comfortable at the net which will help his chances of a good run at Wimbledon once again. He has also had some big wins over the top-four players in the sport so should not fear them in the Grand Slam events if he reaches the latter stages. The United States have not had a men’s Grand Slam winner since Andy Roddick won the US Open in 2003. Despite the country dominating the 1990s with Pete Sampras, Andre Agassi and Jim Courier all winning multiple Grand Slam singles titles, they have struggled in the new millennium to produce players who have been able to break into the top 10 of the world rankings. At number 24 in the world rankings, Sock isn’t the highest ranked American in the standings. That goes to John Isner. However, Sock has age on his side and, if he continues to improve, it will only be a matter of time before he climbs above his American compatriot who has never really threatened to win a Grand Slam. In 2010, Sock won the junior US Open which gave the country hope that they had a future star who could climb to number one in the men’s singles rankings. In the early stages of his professional career, Sock has had more success in the doubles game. Along with Melanie Oudin, he won the 2011 US Open mixed doubles, while three years later he paired with Vasek Pospisil of Canada to land the 2014 men’s doubles championship at Wimbledon. 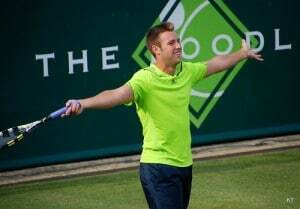 Over the last couple of years, Sock has concentrated on his singles game and he has reaped the rewards as he has climbed up the rankings to leave him in striking distance of breaking through to the top 10 in the near future. Sock has reached three singles finals over the last 12 months. He won the US Men’s Clay Court Championship in 2015, beating Sam Querrey 7-6 (9) 7-6 (2) in a tight contest. Unfortunately for the American, he lost to Berdych in the 2015 Stockholm Open, while earlier this year he had to retire with an injury in the final of the ASB Classic in Auckland when facing Roberto Bautista Agut. Ahead of the French Open, Sock has never been beyond the fourth round of a Grand Slam singles tournament, however, it is only a matter of time before he puts that record straight with a big run. It may not be on clay in Paris or grass of Wimbledon, however, it would be no surprise to see the American put in a career best run in New York for the US Open later in the season. At the age of just 20, Kyrgios has stolen the headlines for all the wrong reason in men’s tennis due to his behaviour on and off the tennis court. Beyond all that, though, the Australian is extremely talented and has already reached the quarter-finals of two Grand Slams. His maiden last eight appearance came in the 2014 Wimbledon Championship as he beat Nadal and Richard Gasquet to make it to the quarter-final where he was eventually beaten by Raonic over four sets. The following season, Kyrgios gave the home crowd something to cheer about at the 2015 Australian Open as he made it through to the last eight in Melbourne where his run was ended by Murray in straight sets. The Australian number one will be full of confidence this year after recently winning his maiden ATP singles title in the Open 13 in Marseille. He beat Cilic in the final to get his hands on the trophy in France. Kyrgios may have to accept being the pantomime villain, however, that should not stop the youngster going all the way to the top in the sport. With Federer and Nadal both reaching the back end of their career and Djokovic and Murray getting no younger, the door is open for some of the younger players to make their mark over the next few years. When Grigor Dimitrov reached the semi-final of Wimbledon in 2014, many pundits in tennis predicted the Bulgarian would win a Grand Slam title within two years. Unfortunately for the former junior Wimbledon winner, he has struggled to maintain that form which saw him into the last four in London. It took Dimitrov a while to adapt to men’s tennis. 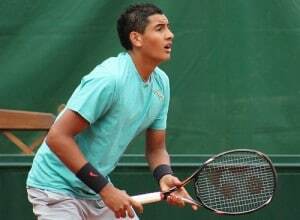 He made the leap after being ranked the number one junior following his success in 2008 when he also won the US Open junior title to add to his Wimbledon success. After a few years playing men’s tennis, he won his first title in the 2013 Stockholm Open. That then led to his best year to date in tennis as he advanced through to the quarter-final of the Australian Open in 2014 before a last-four appearance at Wimbledon. That run on grass will be best remembered for his hammering of home favorite Murray, who he dispatched 6-1 7-6(4) 6-2. He also then gave Djokovic a run for his money in the semi-final as he won the second set before losing two consecutive tie-breakers to go down in four sets. The year of 2015 was a difficult year for the Bulgarian as he struggled for form. He has, though, changed coach since then and has recently shown promising signs to suggest another big run at a Grand Slam could come soon. on Federer as he is a stylish player who does not stay fixed to the baseline.